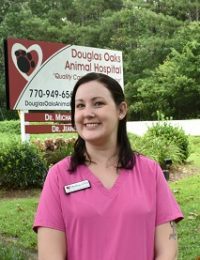 Bailey grew up in Peachtree City and knew since she was 5 years old that she wanted to work with animals. She started her animal career in 2013 and put it on hold for a couple of years to take care of her single child, Aubree. Bailey’s hobbies include hiking and spending time outdoors whenever she gets the chance and playing with her cat Sid.